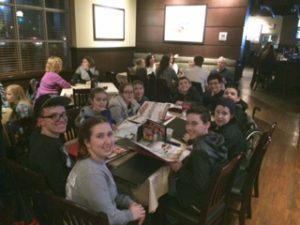 Over the weekend, a handful of our Junior team and their families traveled to London, Ontario for a very exciting weekend. The players were: Alex Brown, Darrion Allensworth, James Humphreys, Abby McCormick, Danny Shanholtzer, Ellie Shanholtzer, Dominic Tarquinio, AJ Vazquez, and Brea Vazquez. I had midterm exams that morning so my family and I drove up Friday afternoon and unfortunately missed the first game at 4:45 p.m. against the Ohio Arctic Wolves. The rest of the team worked extremely hard and won with a final score of 6-1! Goals were made by Alex Brown, Darrion Allensworth, James Humphreys, Danny Shanholtzer, and Ellie Shanholtzer. Our second game took place on Saturday morning at 10:15 and was another huge success! We defeated the Buffalo Sabres with a score of 7-0! There was a lot of great teamwork shown during this game and a lot of great saves by our goalie AJ Vasquez and I even scored my first tournament goal! 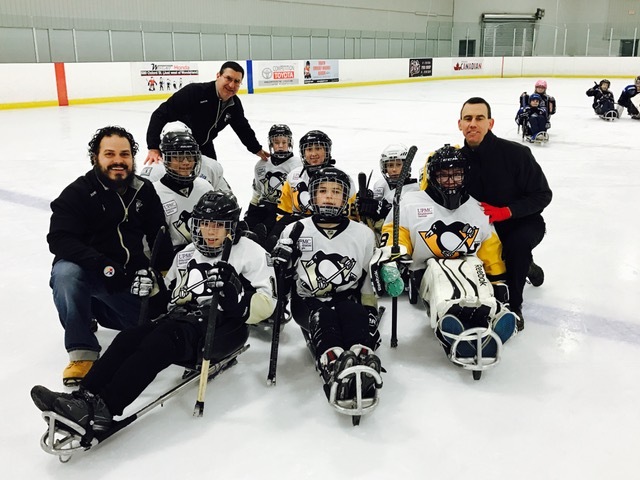 This has definitely been the highlight of my first two years playing sled hockey. The third game was against the Hamilton Sledgehammers at 4:30 p.m. We won again with the final score being 5-0. Darrion, Alex and James scored during this game. We were all ecstatic to be undefeated and make it into the Semi-Finals the next morning! It was quite a different feeling from last year when we didn’t win any games at this tournament. To celebrate our success, we all went to dinner at a restaurant called Shoeless Joe’s and had a lot of fun together. Unfortunately, we lost in the Semi-Finals to the Durham Steelhawks. It was a very close game ending with 4-3. We went home with 3rd place out of 8. Overall, we had an awesome tournament with a lot of incredible teamwork and scored a total of 21 goals throughout the weekend. Everyone played a huge part in our success throughout the weekend. We also could never do this without the help of our awesome coaches! This was definitely one of my favorite tournaments yet.